1) You kids have an amazing live show, don’t change anything. Thanks for the 2 encores tonight. did you play a secret show that I didn’t know about? 2) Neon Bible. I like the record, but I think I’m a Funeral kind of guy. In the live shows? Its going to be a while before you get a louder response for something off the new record when you compare it to songs like Laika or Tunnels. Or even a sick transition from Wake Up Power Out to Rebellion (Lies). 3) My Body Is A Cage would make an amazing dance remix. Its all about Win’s vocal hook. I have no real reason why I believe this, but one day, Intervention might become a Christmas song. Take a listen, does anybody know what I’m talking about?? 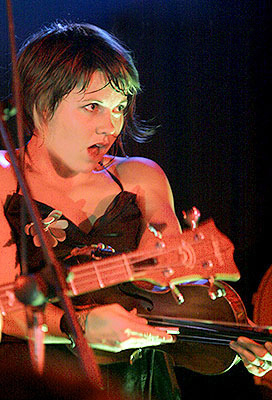 4) and finally, I have a huge crush on Sarah Neufeld. You are quite amazing.